NextVitalogy: Weird, Wonderful and Iconic! Mary Magdalene is to simply put it an enigma. She is one of the more fascinating characters or persons from the gospels. Her devotion to Christ is second to none, which might explain our fascination or affections towards her. She is I believe an incorruptible heroine of the faith and not the sinner and fallen women that she was portrayed as during the Middle Ages. I think it’s fair to say that we are cluey enough to realise that the attempts to sully her name were done for selfish and or chauvinistic purposes. 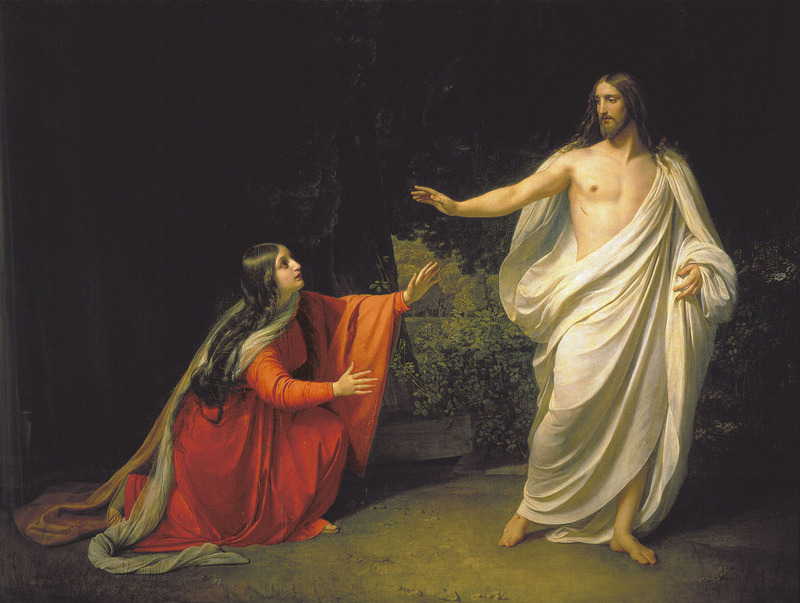 The following article is a very short study of Mary Magdalene accompanied by some of the more interesting historical paintings or interpretations of her. It is important to note that many of the great artists throughout the ages had rendered their own interpretations of her for dramatic or propaganda purposes. They were of course influenced by what was deemed an acceptable image by the church at the time, but that was not always the case. I have chosen only a handful for the purposes of this article. Magdalene with the Smoking Flame by Georges de la Tour France, c.1638-1640. 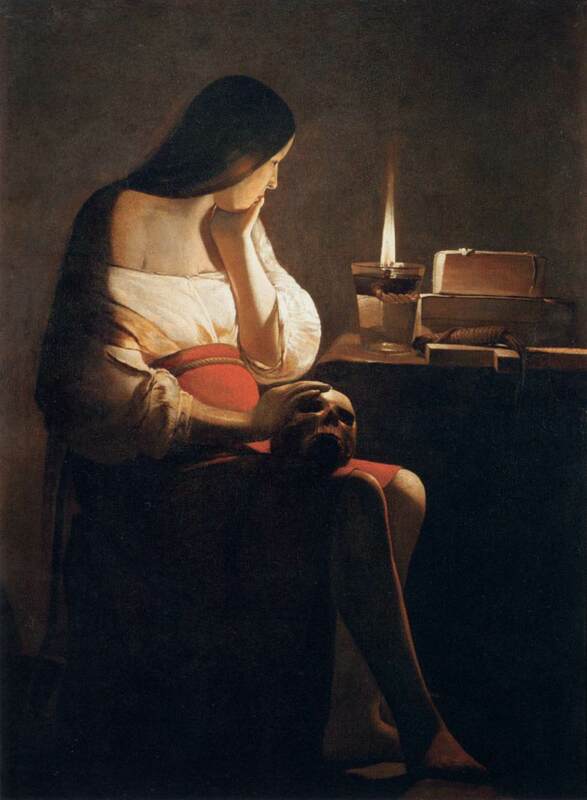 The Magdalene with the Smoking Flame by Georges de la Tour is one of the most simplest, yet strikingly beautiful portraits of the beloved Mary Magdalene. A while ago it caught my attention because of its astute use of shadow and light. Our eye is drawn to the glow of the candle that lights up Magdalene’s pale face. She sits transfixed in a state of contemplation. The book of scripture, a scourge (whip) and the skull also add much to the intrigue of the scene. One or more of these elements are almost always present in depictions of Mary Magdalene. Of particular interest is the skull, which is sometimes said to emphasis Mary’s nostalgic longing for Christ. Is that why she rests her left hand to her face? Is she sad? In short, surely it is fair to say that she must have been very close to Jesus? She attains a prominent place in his last days, in which all the gospels point out. Jesus appearing To Mary Magdalene after his resurrection by Alexander Andreyevich Ivanov, c.1835. Mary’s relationship (so to speak) with Jesus is primarily identified in the gospels. At last count there are at least a dozen mentions of her in reference to Jesus. Importantly, she appears in the foreground of the most important moment of his life: she stays with Jesus when his disciples abandon him at his hour of need, she mourns his death at the crucifixion, she is present at the tomb when Jesus body is missing, and most importantly as illustrated here in Alexander Andreyevich’s painting, she is the first person to whom Jesus appeared after his astonishing resurrection. It is also through Mary that she subsequently relays Christ’s message to the others that he has risen. 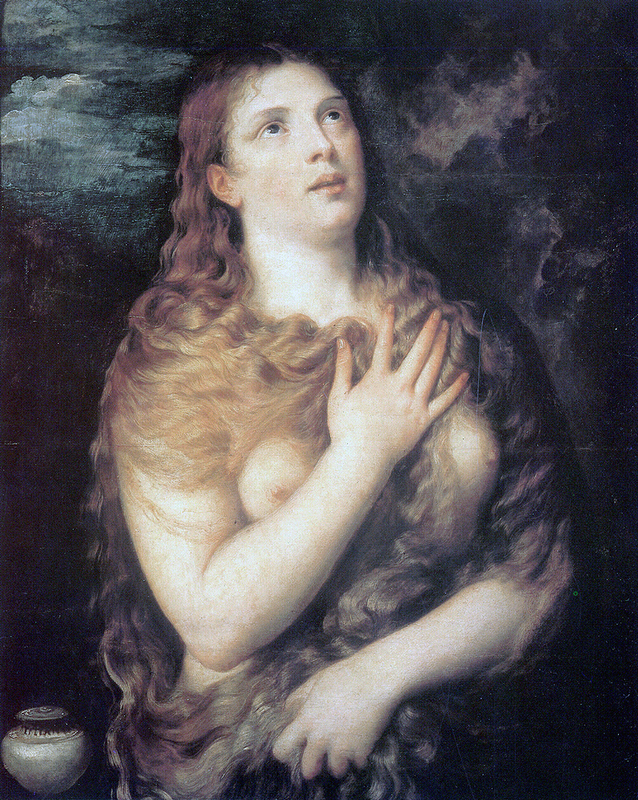 The Penitent Magdalene by Titan, c.1533. Is it fair to say that this ‘discrediting’ of Mary also went too far in medieval portraits of her? For example, for a long time it was vogue to portray Magdalene naked or with very little clothing. Titan’s famous painting of Mary Magdalene in particular gives us a glimpse into a world that combined both eroticism and religion to great effect. Titan was probably trying to be shocking, but to his credit he covers Mary’s naked body with her long hair to symbolize her at a moment of elation and deep repentance. Mary Magdalene In the Cave by Jules Joseph Lefebvre, 1876. Mary Magdalene In the Cave, for me, is another startling interpretation by Jules Joseph Lefebvre, as a “fallen woman” that is worth highlighting. In it Mary is spread out arched along the ground in a cave, supposedly not long after Jesus’ crucifixion, during her flee from Jerusalem. For some, it is again, another injustice to Magdalene’s character as a heroine of the faith. (In spite of that, as a painting that shows the female form it is still quite beautiful.) Nonetheless it is important to understand that, even as late as 1876 when this was painted, the idea of Magdalene as a fallen women or sinner who overcame her flaws, was gratifying to those ashamed of their own sexual misbehaviour. Interestingly, the reason why Mary Magdalene is often portrayed naked in many paintings like this one, is to symbolize her abandonment of worldly goods, which includes her clothes. All she needs, it seems, is her faith in Christ. 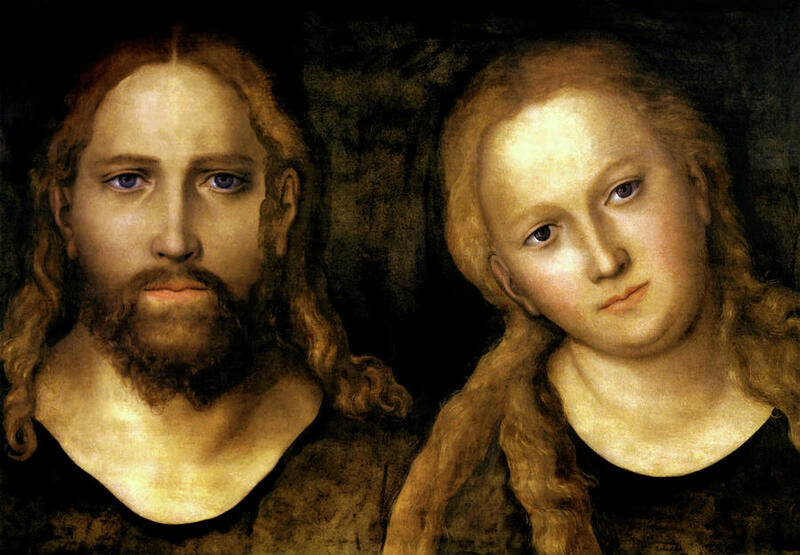 Jesus and Mary Magdalene painted by Lucas Cranach, 1520, Friedenstein Castle in Gotha, Germany. We cannot seriously go any further with our brief look at Mary Magdalene without looking at the spotlight that was shone on her (and Jesus) by the Apocryphal Gospels. Some theologians argue that the mere mention of these books is heresy, while others argue that the Mary Magdalene in these texts just might be closer to the historical Mary many people crave. The very surprising ‘truths’ in these gospels suggest that Mary Magdalene had a very close relationship with Jesus, which can be interpreted to mean that she was his partner, maybe even his wife. I see no sense in getting infuriated with such conjecture. But let me ask you this, what if it were true? Surely, we could all relate more to a Jesus capable of earthly things? Nonetheless, with not enough historical evidence its probably best to leave this debate alone. 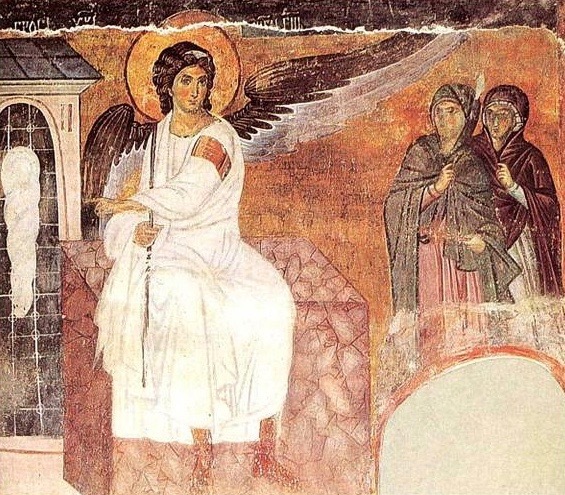 Myrrhbearers at the tomb of Christ, c 1235 AD, Mileševa monastery in Serbia. In summary, the Eastern Orthodox views of Mary Magdalene, celebrated as a Myrrhbearer and never as a penitent, is something that I can relate to. Unfortunately I cannot speak for others, and she will remain to many still today a conundrum. Though, what is not disputed is her special place in Christianity, as a saint and the first female ‘apostle’. In short, I think it is safe to say (even though we really, really don’t know much about her) that she was an important and determined woman who put her faith in Christ above all else. Photo Credits: The header image is the Penitent Magdalene by artist Guido Reni, c. 1635,Walters Art Museum. All images used are in the public domain except the image of the Myrrhbearers at the tomb of Christ which is used under the Creative Commons Attribution-ShareAlike 3.0 license. Fascinating stuff. I think the Alexander Andreyevich Ivanov piece is the most evocative. Was always fascinated by Mary Magdalene, particularly some – though not all – of the more modern reappraisals of her story and her role in early Christianity. There are some very good books written around the suggestion that she may have been one of the key founders of Christianity, more so than even the 12 Apostles, and that she lived out most of the rest of her life as a recluse/mystic in France. Three amazing female characters that have reawakened my excitement and love for Star Wars.